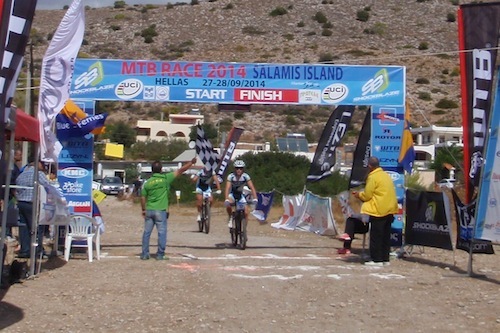 Salamina Island XCO, Race 1 & 2, Greece. Coming off the back of the Taça de Portugal, it was clear that both of us were starting to find some true form. 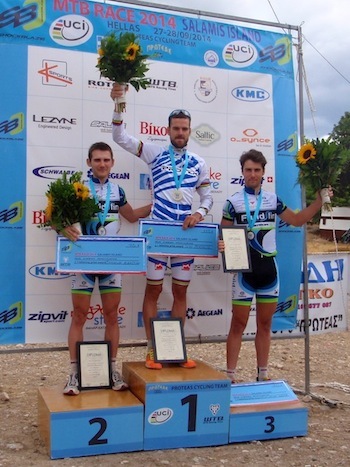 With that in mind, we were determined to put together two top races on Salamina Island (just off Greece) a couple of weeks later. The travel down to Salamina was on the long side, thanks to a jackknifed van and trailer on the M25 on route to Gatwick. A late flight in to Athens and then some dodgy hotel sign, or lack there of, on Salamina Island. 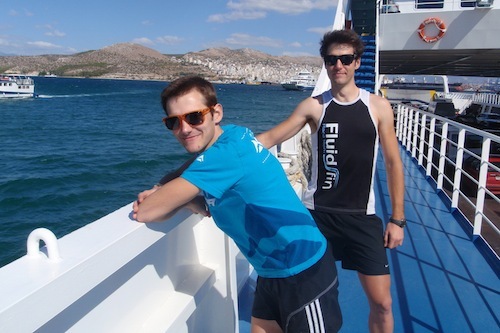 On our arrival in Greece, the weather was fantastic, which made everything a little easier. The weather and temperatures were indeed most certainly dramatically different compared to the last time we were on a ferry from Moss to Horten in Norway. It was our first visit to Greece and it was typically southern European in every way, right down to the crazy driving and endless mopeds and bikes weaving through the traffic with riders sans helmets. The hotel was also a casual and basic operated business with bizarrely wonky and strange angled walls. We tried to discern whether this was a deliberate feature or just shoddy workmanship, and after deciding that it was more awkward than quirky we opted for the later. However with two Category 2 races to focus on, we were there to do a job. The races were to be held on both the Saturday and Sunday and there were different course for each day. On Friday, we were greeted by a howling gale and rain (the wind lasted the duration of our stay), which coincided with course practice on an unusually damp morning. We took in a lap of both courses to see what was on offer and get a feel for how things might unfold. The terrain under tyre was very barren, massively rocky and loose making our Conti ProTection tyre compound definitely the way to go, to reduce the chance of puncturing. Also with the start/finish area literally 15 meters from the sea, the wind was clearly going to play a part in the proceedings. The opening course was a little bit of a disappointment. It consisted of a long false flat drag inland, with a couple of short steep punches, a 90 degree turn, and a high speed motorway section back down to the sea. Saying that, it is always good to race different types of courses and not always ones that you necessarily feel suit your strengths and style. Given the track, it was clear that it was going to be a fast and potentially tactical race – not too dissimilar to an off road crit. Following the start, there was a reasonably long section of wide track, which would give ample time to move through the pack, so with Hamish gridded row two and me directly behind him on three, we didn’t feel overly pressured to get outstanding starts and be in the top 5 after 100 meters or so. However like so often when you don’t need it, it happens and I had an absolute flyer from behind Hamish and nearly made the top 5 by the first bend with Hamish just to my side. Certainly not going to complain about that. With the track so wide at that point, it meant everyone was trying to move forward and be near the front which involved lots of pushing, swerving and generally good old aggressive Euro racing (where you always need a sharp pair of elbows). We’re fairly well trained in this now, so held our positions well and sat 4th and 5th wheel as we hit the first singletrack short climb. As the ground was so loose, traction was hard to come by in places. This certainly became more obvious when putting the power down. So being sat back in the lead group on lap 1, there were a number of times where one or both of us were stalled by the rider in front requiring: us to work back on to the group using up some energy reserves. Towards the end of the first lap, the lead group had been whittled down to just five, with both of us in the mix. 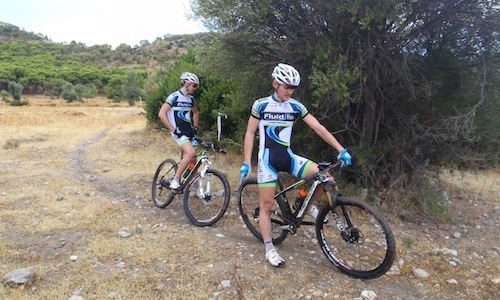 However, on one max speed rough section, Hamish lost his chain, which required a dismount to put it back on. I was on his wheel at the time and thought (given the speed we were going) that this technical disaster would put him out of contention. Coming round the next lap, one rider jumped clear on a singletrack section, as the guy sat in second place let the wheel go. He was clearly feeling the affects of the first lap. Once I got round the second positioned rider, I took up the chase, but with the gap he had built up, and the man-on-man battle on the false flat (in to the head wind), I just didn’t quite have the firepower to close it down quickly. Nearing the halfway point of that lap, I turned to discover Hamish was back in contention and that another rider was now off the back. It had taken him a monumental effort to close the gap down and bridge back up to the front. A lap later, we had dropped the remaining rider and were now in team time trial mode, trying to catch the leader up ahead. By the final lap he had built up too much of a gap and knowing we weren’t going to catch first place and that we were far enough ahead not to be caught by fourth, we hit the cruise control, to save the legs for the next day. Coming in to the finish together to take second and third was pretty awesome, especially the way we had done it. 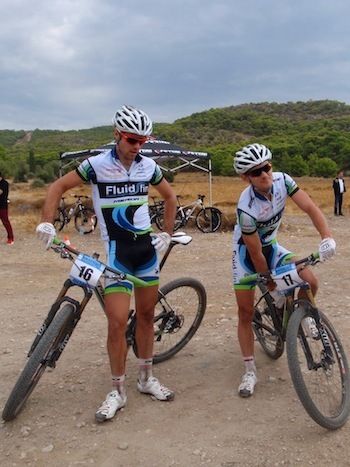 Certainly a team effort, which dominated the podium proceedings. 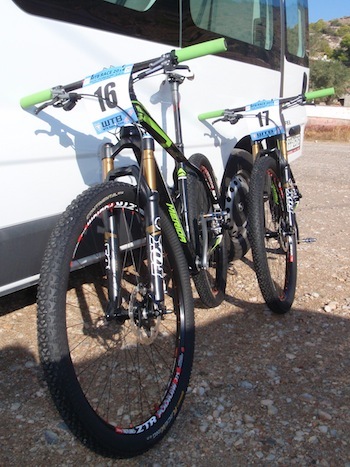 Following Saturday’s race, as well as some serious recovery, there was also a bit of bike cleaning and prepping to do. With back-to-back racing, you really don’t know how your body is going to be the next day, so we always just try and rest up as much as possible in the hope that all will be good to go. 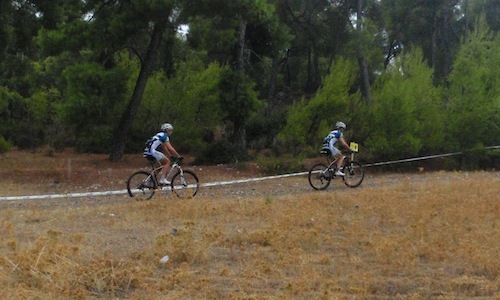 Given the previous day’s results, we were both riding a high and were gunning for it again. This was certainly helped by our knowledge and experience from Friday’s practice run and so we both fancied our chances. With over 200m of climbing per lap, some of it steep, up to the top of the mountain followed by a long (and in places) technical descent, it was much more to our liking and a very good course. We had the same gridings again, but didn’t get the sweet starts this time around, so were much more caught up in the peloton. Hamish was up ahead in the group and I worked really hard to move up, before the track singled out and started going properly up hill. The last thing I wanted was to get stuck behind some slower riders and then have to bridge to the lead group. Strangely, the race was more tactical than the day before, perhaps there were some tired bodies in there who were trying to bluff their way in to a good position? They might have tried, but this is mountain biking on a course with a massive climb, so if you don’t have the legs, you aren’t going to get anywhere. By the second lap, we were down to the same five riders again, with two of them in the group working together in a rather annoying way. 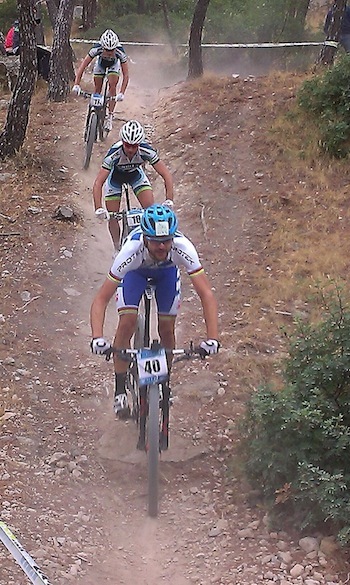 One rider would sprint to take the lead on the singletrack sections of the climb and then ease right up and block us out from pushing on, which was infuriating at the time. There soon came a point where I had had enough, so as we hit the fireroad, I put the metal down, to see if I could get rid of the guy. For the next lap or so he hung around (mainly off the back but occasionally at the front), until it was down to Hamish, myself, and Saturday’s winner Periklis Ilias – the 2012 World Marathon Champion. With two laps to go, Ilias made his move and slung-shot himself from the back of the two of us (with Hamish leading at the time on a headwind section just before the final kick of the climb). We both tried to go with him and then close the gap on the descent, which we were absolutely flying on, but he managed to hold on to a gap by the bottom and it was again man-on-man, head-to-head. The last two laps got seriously intense as we maxed out trying to close down the leader and take the win. We couldn’t quite do it, but it seemed almost unreal crossing the finish line again for another double podium just 24 hours later in a similar, but much harder fashion to Saturday. 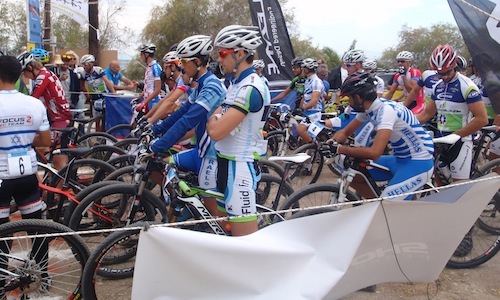 The two really hard races culminated to make a brutal weekend’s racing. It had been an incredibly successful weekend, which made all the hard work preceding it worthwhile. 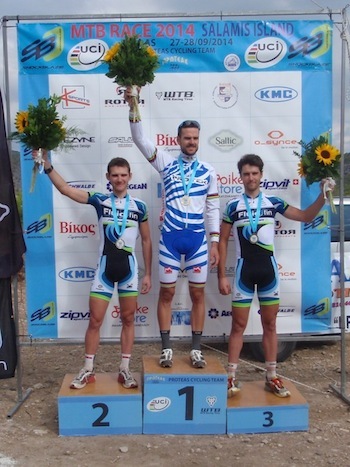 A double, double podium was amazing. Both bikes and bodies were on top form, and with the final race of the season yet to come in Portugal, it looks like the end of this season is turning out to be a cracker.